Veterans Advisory Council - Times Publishing Newspapers, Inc. The Veterans Advisory Council (VAC) is a single-point Veteran information and advice resource for Lower Southampton residents and Veterans, Municipal Agencies, and the Board of Supervisors. The VAC either has the information, or access to information needed by these entities. The VAC tracks and distributes information about local, county, state and federal Veteran resources and events and works closely with other Veteran organizations to provide information. In the past year the VAC has distributed donated funds to individuals and veteran outreach programs that were in need. These funds help support local, regional and national veteran programs. The Delaware Valley Veteran Nursing Home, the Bucks County Veteran’s Court & Mentoring Program, Operation First Response Veteran Brotherhood, Salute2Service, and the Travis Manion Foundation are some of the recipients of last year’s grants. They hope to continue to improve their outreach and supports to our American Hero’s and their families. The VAC offers a number of events in which they honor and provide information to the Veterans of Lower Southampton and beyond. *On April 13th at 10:00am, join us at the Neshaminy Activity Center for the Eighth Annual Veterans Muster. *Then in June join us for a Flag Retirement Ceremony at Playwicki Farm. *In September put on your running shoes and get moving during the 9/11 Heroes Run at Russell Elliott Park. *End the year by joining us on November 11th for a Veterans Day Sunset Retreat Ceremony at Playwicki Farm honoring all who serve. If you are interested in becoming involved with or volunteering with this organization, please contact a representative at the phone number or email address below. The Veterans Advisory Council meets in a public meeting at 7:00pm the first Tuesday of each month, excluding July and August. The public is encouraged to attend at the Lower Southampton Township Municipal Center, 1500 Desire Avenue, Lower Southampton. Call 267-982-2199 or e-mail lstwp.vac@gmail.com for more information. 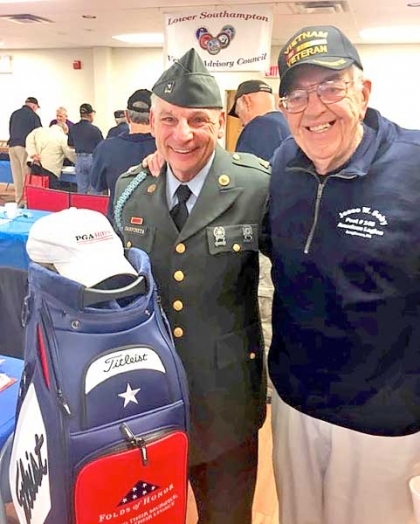 PHOTO CAP: John Carpineta representing the PGA Hope Program for Veterans, and Bill Stout of the Jesse Soby American Legion Post 148 attending VAC’s 2018 Annual Muster.